Some relatives of those killed in the 1971 McGurk's Bar bombing are angry at a Police Ombudsman report. The report, to be published on Friday, contains "glaring errors" and wrongly clears the police, they claim. Relatives said the report suggested doubt remains about whether the UVF were behind the explosion. The families said the report contained factual inaccuracies which displayed "a casual disregard for the sensitivities of the victims". They said the report left out the name of one of the victims from a list of the dead, while the same list included the name of a relative of another victim, who is still alive and who referred the case to the Ombudsman. A spokesman for the Police Ombudsman said: "We ackowledge that some of the families appear to have difficulties with parts of our report and we will of course arrange to meet them very soon to discuss these." The attack caused the single biggest loss of life in Northern Ireland until the Omagh bomb in 1998. In 1977, a UVF man who drove the getaway car admitted his part in the attack and it became clear that it was carried out by loyalist paramilitaries, the Ulster Volunteer Force. The driver received 15 life sentences and remains the only person ever to have been convicted in relation to the explosion. The families said the report "appears to ignore the fact that police knew, by 1977 at the latest, that the UVF were responsible for the bombing". "This was subsequently confirmed by the Historical Enquiries Team report of 2008 and a statement to Parliament. "Instead the report appears to indicate that doubt remains in this area." Patrick McGurk, son of the bar owner, said: "My initial view is that it (the document) smacks of the police trying to absolve themselves of all responsibility for any wrong doing or incompetence." 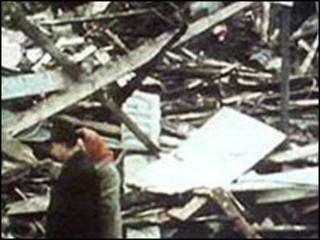 Days after the bombing, the then Stormont minister for home affairs, John Taylor, told parliament that the theory the explosion took place within the building was supported by forensic evidence. While it is believed the Police Ombudsman found no evidence that RUC officers briefed Mr Taylor with false information, the families insist the claim it was an IRA bomb-in-transit came from a duty police officer. The Police Ombudsman's report will be published on Friday.